Model calculation of water vapor enthalpy entropy Wan Xue;Ren Tieliang;Yang Yi;Li Baodong;Sinosteel Anshan Research Institute of Thermo - Energy Co. Intelligent control system and its implementation with vertical furnace gas purification Ren Tieliang;Li Zhihong;Zhao Baofeng;Ye Ting;Liu Wenwu;Wang Xiuchen;Sinosteel Anshan Research Institute of Thermo - Energy Co. Analysis of the flue gas inspection on Liuzhou iron and steel furnace Wen Xulin;Feng Zuqiang;Lu Yanhui;Guangxi Liuzhou Iron and Steel Co. Preliminary study on waste heat recovery in titanium sponge reduction process Pang Huixia;Wu Fuzhong;Cai Zengxin;An Honghao;Guizhou University;Zunbao Titanium Co.
Research on low NO_x combustion technology of high- temperature air Wang Hao;Zhan Maohua;Cheng Hanfei;Cao Qiang;Wang Lei;Energy Conservation and Environmental Protection Research Institute Co. 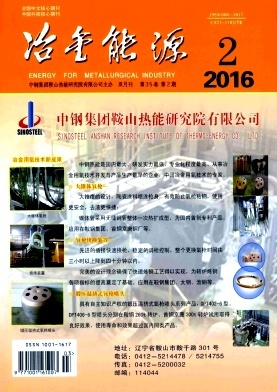 Application of three impulse PID control system in the heat exchanger steam drum level control Wang Chenming;Chen Yanmei;Sinosteel Anshan research institute of Thermo - Energy Co.